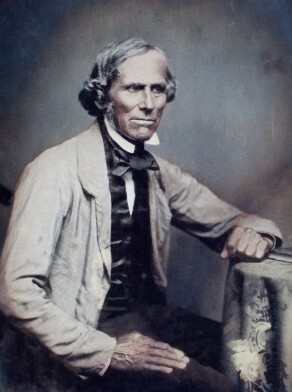 George Paton was born on 15 December 1800 in Largs Scotland, son of William and Jane Paton. His uncle was Theophilus Paton, laird of ‘Swinlees’, Dalry, Ayreshire, Scotland. On 2 January 1824, at Largs, Scotland, he married Jean Kerr (d.17 February 1861, aged 61). They had five daughters and five sons. He died on 23 August 1860, aged 60, at Kilwinning Farm, Fivedock, and was buried in the Presbyterian section of Rookwood Cemetery. George and Jean Paton arrived as free immigrants on the ship Stirling Castle on 11 October 1831. His brother Robert migrated to Australia, arriving on the ship Mountaineer on 7 September 1832. George and his brother Robert were both stonemasons active in Sydney in the 1830s and 40s. George Paton was one of the skilled Scottish mechanics selected by the Reverend JD Lang to come to Sydney to construct the Australian College. As a Master Stonemason and Contractor he was also involved in the building of the St Andrews Scots Church (1831), Berrima Court House (1838), the Holy Trinity (or Garrison) Church in Fort Street (1840), the Australian Museum (1846), the Sydney Post Office (1846), the Signal Station (1848), and the Gosford Court House and Police Station (1848). He had also purchased land in The Rocks, near the Garrison Church, where he built the Hero of Waterloo (1843) from sandstone from the Argyle Cut. George also took on the public license at the Hero of Waterloo. George built up a considerable property portfolio and on his death held three houses in William Street, 10 houses in Kent Street (the Paton buildings), the Hero of Waterloo, houses in Wentworth Street and a farm at Fivedock. His brother Robert was the Superintendent of Works at Circular Quay from 1839-49 and was responsible for building the ‘semi-circular quay’. In 1844, Robert Paton sculpted and sold for £50, by subscription, the Royal Coat of Arms for Customs House on stone sourced from Pinchgut Island. Robert and his family migrated to San Francisco in 1851 where he continued as a stonemason. He died in San Francisco in 1880. George Paton was Councillor for Gipps Ward, 1 November 1847 to 8 September 1851. Society of Australian Genealogists: Rookwood Index.